What if you’ve signed in to Chrome on your friend’s computer or on your office computer. So, before anyone snoops your browsing history and password, you should sign out of chrome immediately after finishing the work. In this post, I’ll show you how to quickly sign out of Google Chrome on all devices. 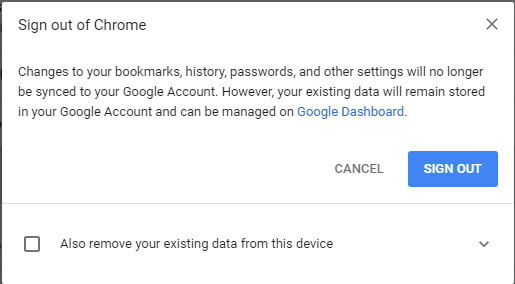 Signing out of chrome will no longer save your history, bookmarks, passwords, extensions, browser preference, etc to your Google Account. Chrome won’t sync these settings anymore after you’ve logged out of Google Chrome. Note: Chrome Sign in/Sign out feature only works if you have already created a Google Account. On your computer, open Google Chrome browser. If you don’t have chrome, learn how to download and install chrome on your device. At the top-right corner, click menu icon (3-vertical dot) and then click Settings. Under “People”, you’ll see your logged Google account. Click “SIGN OUT” next to it. A confirmation pop-up will appear. Click “Sign out” to confirm. If you want to remove your saved data from your computer, select the checkbox ‘Always remove your existing data from this device‘ before clicking Sign out. Open Chrome app on your android device. Tap menu icon (3-vertical dot) on the top-right side. Tap “Sign out of Chrome” at the bottom. Tap “SIGN OUT” to confirm. Open Chrome app on your iPhone or iPad device. Tap “Sign out of Chrome”. By following the above methods, you can easily be logged out of chrome across all your devices. You won’t be able to sync your Chrome settings to your Google account. If you like this article, please follow us on Facebook. Feel free to join the discussion by leaving a comment below.